Farewell March, hello April! Are any of you planning on playing a prank on your family or friends tomorrow? :) One prank that the other half played on me when we first met was when we were interns at Apple (yea we met there... hehe), he stuck a sticky note that read, "April fools! :)" under my mouse so the laser didnt register that I was trying to move it around. I was banging my mouse on my desk, checking the cord making sure it was plugged in, readjusting my mouse pad, etc. Then I looked under the mouse and saw his note. He is quite a prankster, we'll see if he has anything up his sleeves this year. I'm about average height, 5'4", and always have a ridiculously hard time finding jeans that do not require folding up or in, but ever since I got these ankle skinnies from 7 For All Mankind, I can't stop wearing them. They look so good with flats, boots, heels, everything! And here are a few of my other ankle jean picks if you are on the market for a good pair! 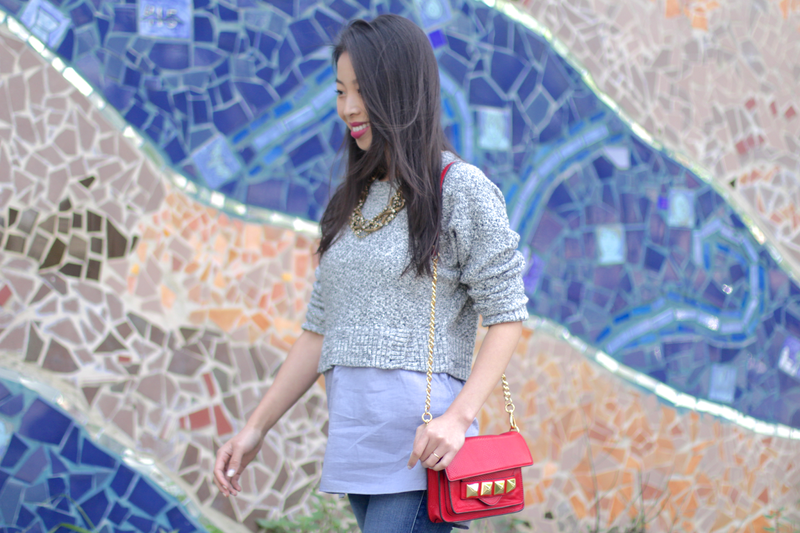 Top: Tweed Layered Pullover from Banana Republic. Steal: Tweed Layered Pullover from Banana Republic. 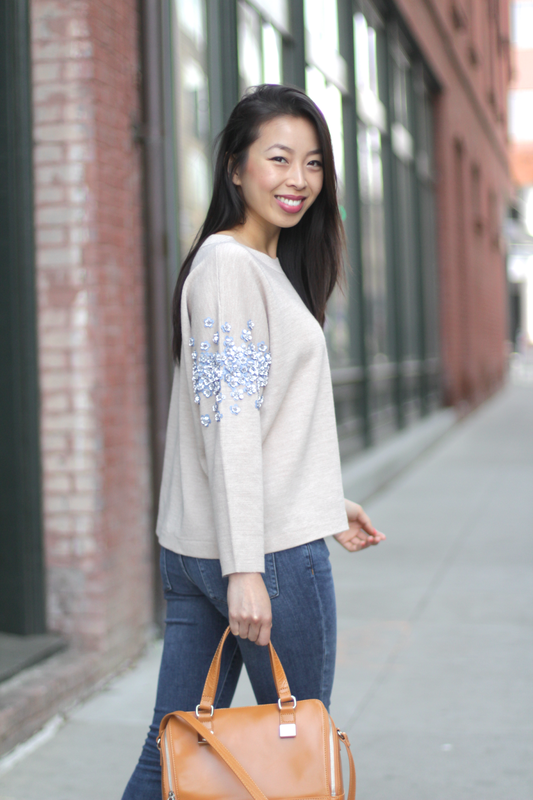 Splurge: Eyelet-Panel Sweater from J.Crew. Jeans: 7 For All Mankind The Ankle Skinny in Slim Illusion Aggressive Atlas Blue. Steal: DL 1961 Emma Legging Jean from SHOPBOP. Splurge: 7 For All Mankind The Ankle Skinny in Slim Illusion Aggressive Atlas Blue. Steal: Dailylook Polished Chain Link Necklace. Splurge: BaubleBar 'Courtney Lite' Necklace from Nordstrom. Steal: Alexander Stamos Vegan Leather Crossbody Bag in Red from Dailylook. 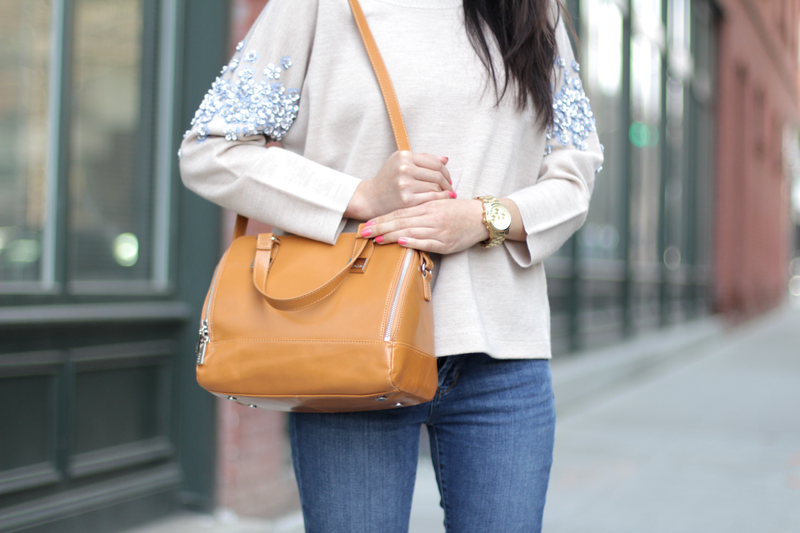 Splurge: Lauren Merkin Mega Med Crossybody Bag from Anthropologie. Shoes: Steve Madden 'Stecy' Sandal from ZOOSHOO. Steal: Simple Strap Heels from Dailylook. Splurge: Steve Madden 'Stecy' Sandal from ZOOSHOO. The weather in the Bay Area has been beautiful! 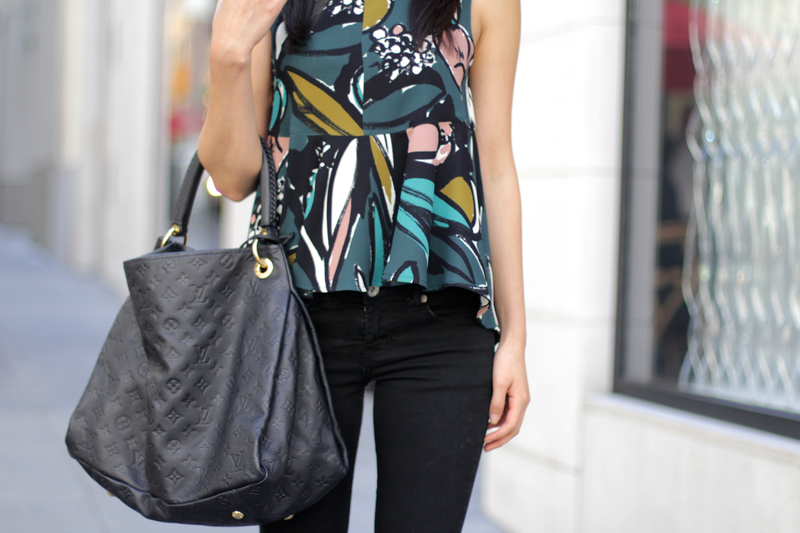 High 70s to low 80s, and for todays pairing I went with this fun floral printed top. It actually has a really pretty green to blue gradient that was hidden by the shorts, but have a look at the link below to see the full top! Top: Painted Floral Dip Dye Top thanks to Karen Kane. 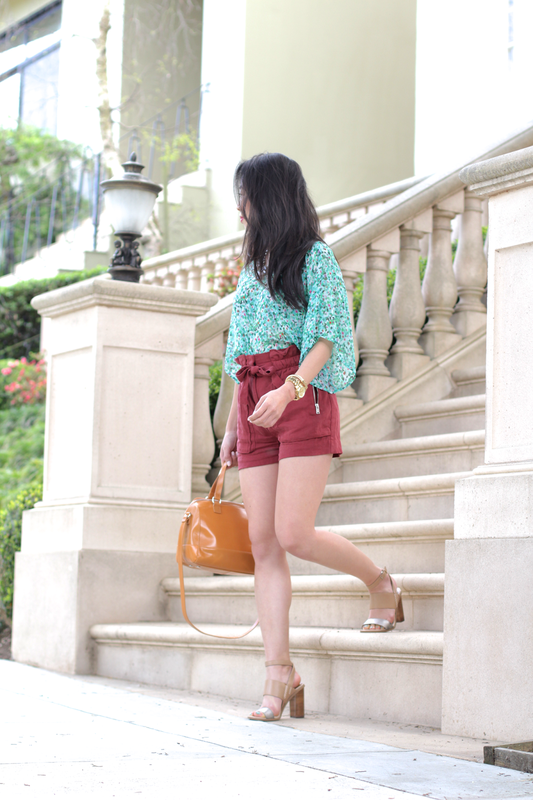 Steal: Lace-Paneled Baroque Print Top from Forever 21. 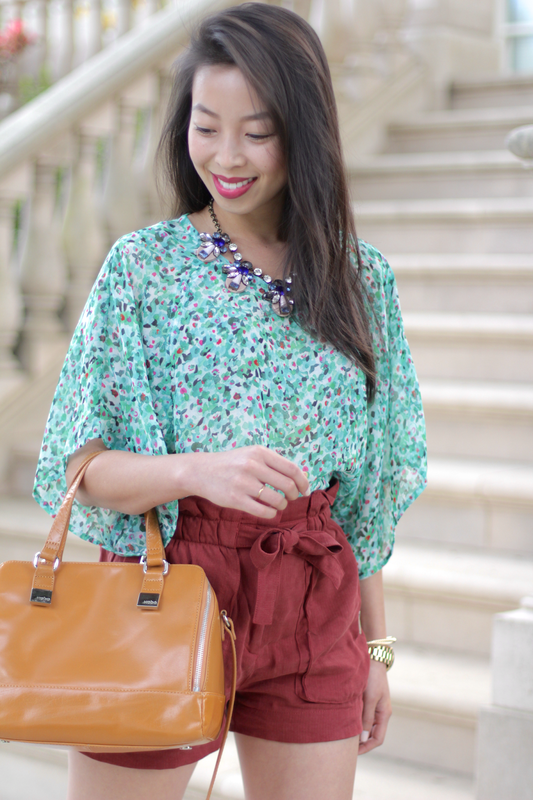 Splurge: Painted Floral Dip Dye Top from Karen Kane. Splurge: ASTR Embroidered Drawstring Shorts from Nordstrom. Bag: Isabel Handbag from Hobo Bags. 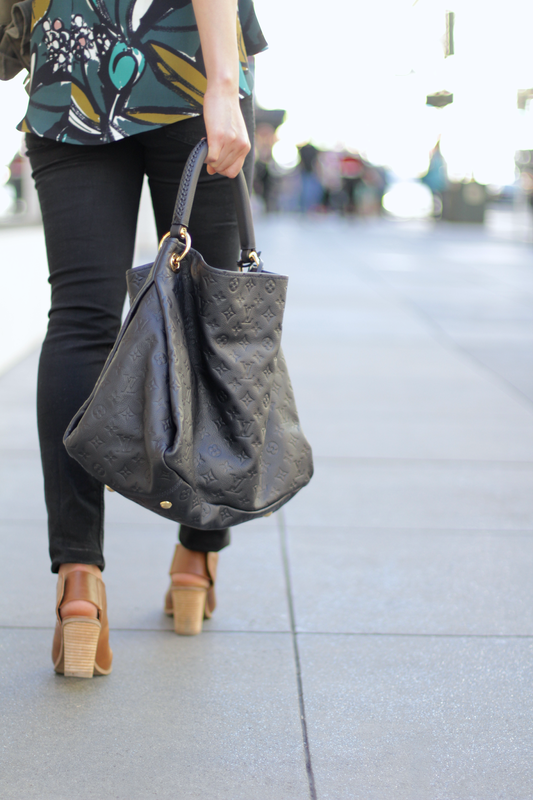 Steal: Isabel Handbag from Hobo Bags. Shoes: Dolce Vita Wendi Leather Sandal in Beige thanks to Dailylook. Steal: ROSELA Sandal from ZOOSHOO. Splurge: Dolce Vita Wendi Leather Sandal in Beige from Dailylook. Happy St. Patrick's Day! Did you remember to wear your green today? I am wearing green on my nails, hehe... But how pretty is this yellow top. Nothing says Spring like bright yellow and when I saw this at a ZARA store, I had to have it. I really like the cross-over drape look and it is so light and airy which really helps on hot days. 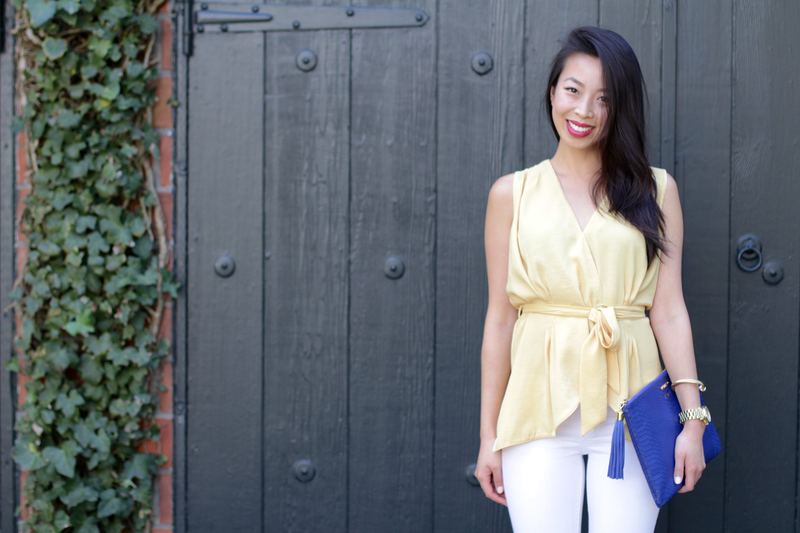 See some of my picks for other pretty yellow tops below! Top: Yellow Tie Waist V Neck Top from ZARA. Steal: Yellow Tie Waist V Neck Top from ZARA. 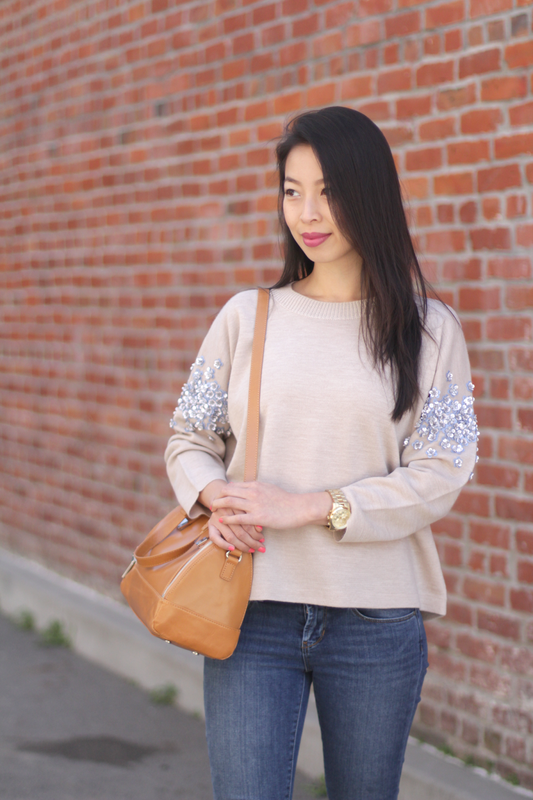 Splurge: Rebecca Minkoff Dev Tiered Top in Sun from SHOPBOP. Jeans: Articles of Society 'Sarah' Skinny White Jeans. Steal: Articles of Society 'Sarah' Skinny White Jeans. Splurge: 1969 resolution true skinny skimmer jeans in white from Gap. 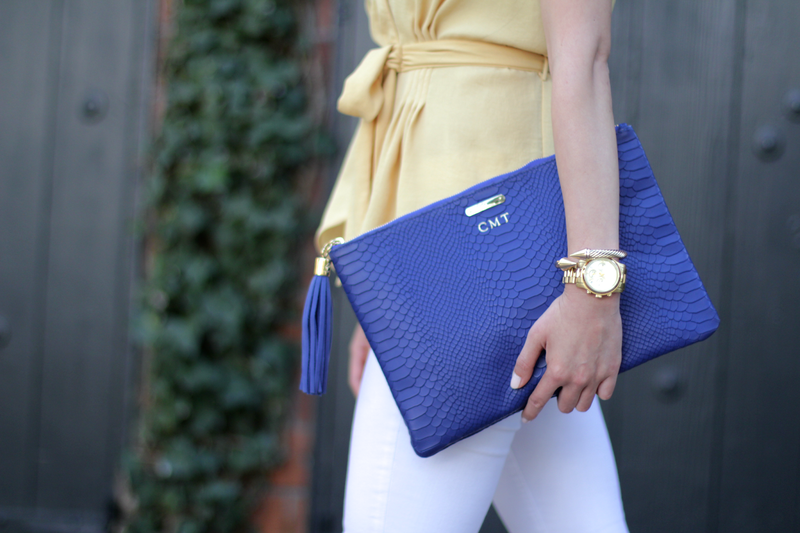 Steal: Tildon 'Emilia' Foldover Clutch in Blue from Nordstrom. Shoes: Katherine Cork Wedges from Elaine Turner. Steal: DV by Dolce Vita TABBY Wedges from ZOOSHOO. Splurge: Katherine Cork Wedges from Elaine Turner. 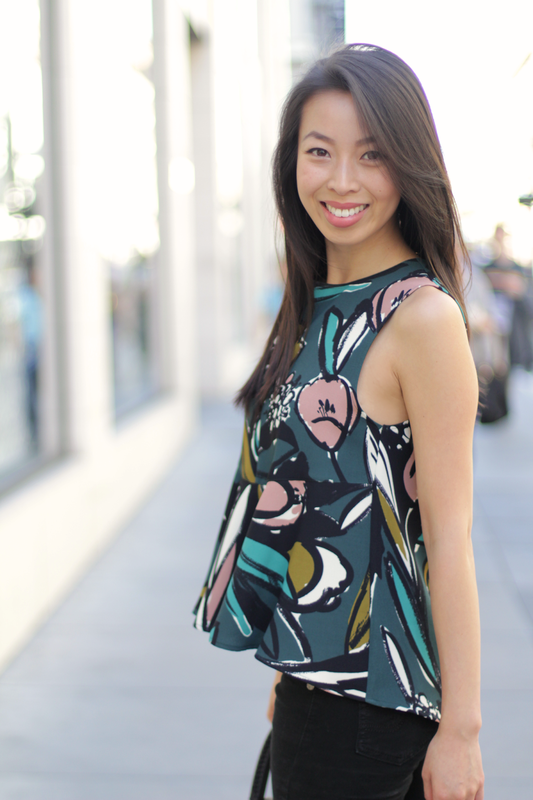 Dress: Topshop Floral Print Peplum Top from Nordstrom. 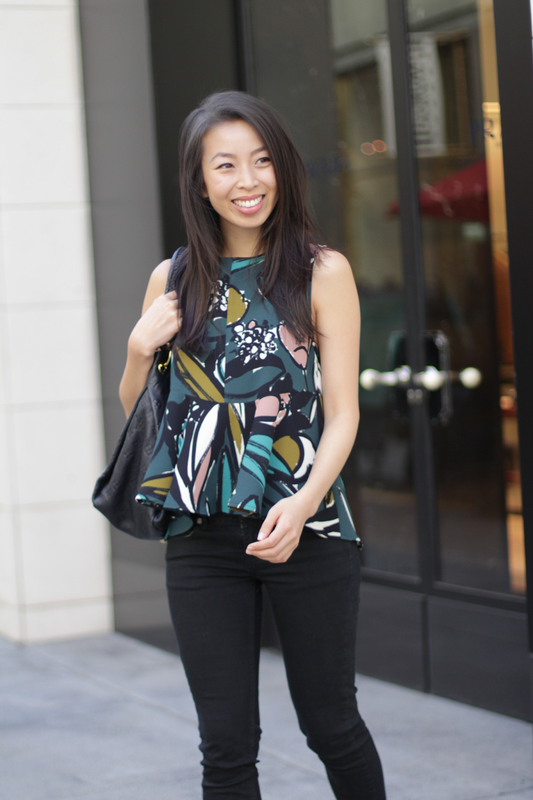 Steal: Seamed Sleeveless Top from ZARA. 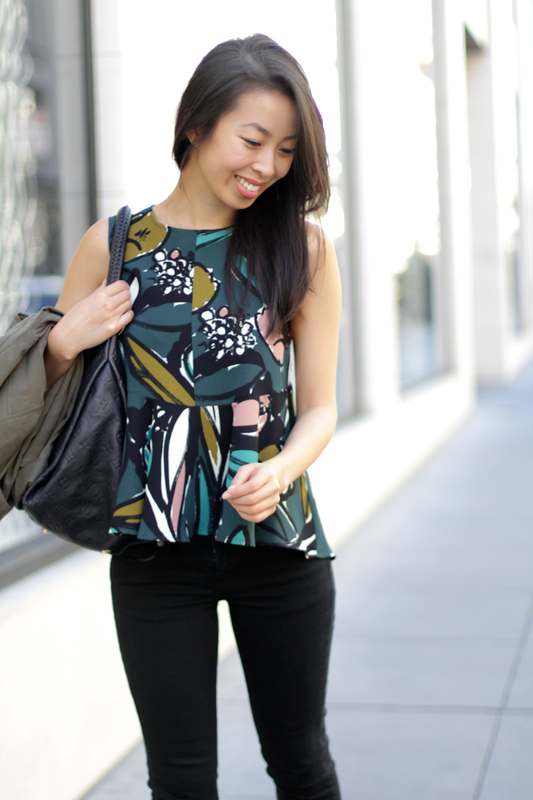 Splurge: Topshop Floral Print Peplum Top from Nordstrom. Steal: Maison Scotch Crinkled Biker Jacket in Olive from Dailylook. 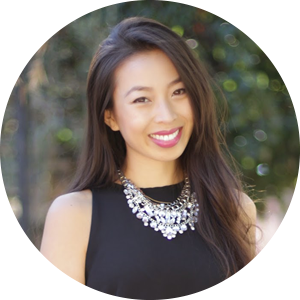 Splurge: Eileen Fisher The Fisher Project Classic Collar Crop from Nordstrom. 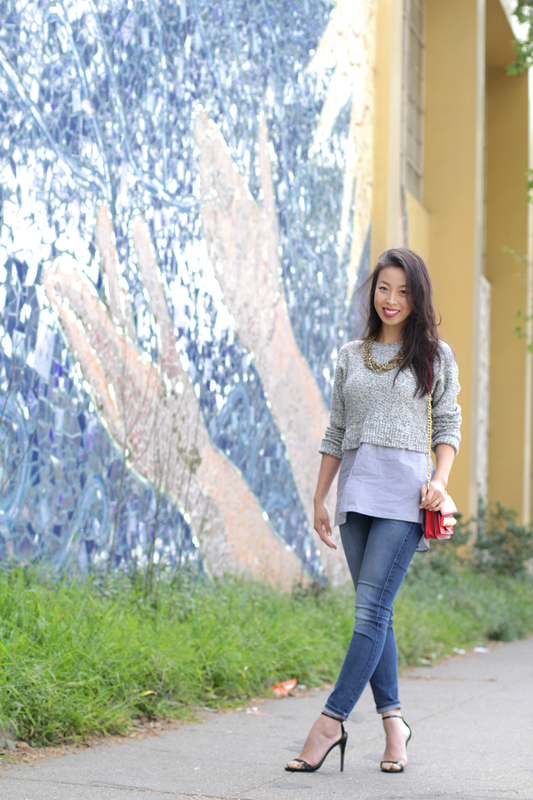 Jeans: Skinny Black Jeans from American Eagle. Steal: Skinny Black Jeans from American Eagle. 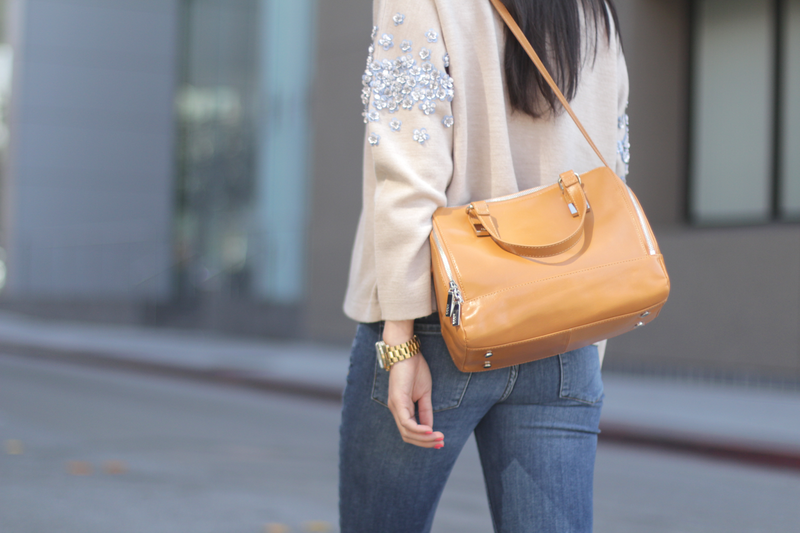 Splurge: Paige Denim 'Skyline' Skinny Jeans from Nordstrom. Shoes: Steve Madden 'Nobel' Open Toe Booties from Nordstrom. Steal: Steve Madden 'Nobel' Open Toe Booties from Nordstrom. Splurge: Madewell Fay Sandals from SHOPBOP.